We’ll be meeting again tomorrow at 10.00am. Hope to see you all there. 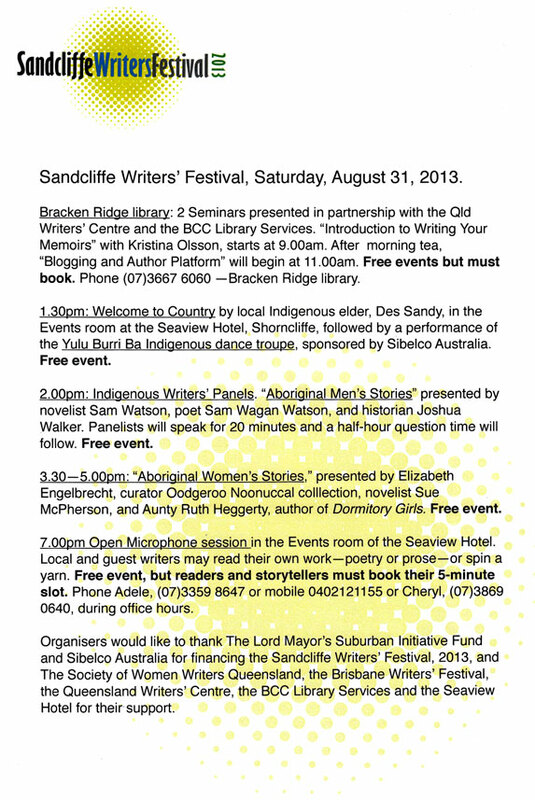 The news about the Sandcliffe Writers Festival is good. We have been awarded the funding for which we applied from the Lord Mayor’s Suburban Initiative Fund and have been promised a thousand dollars specifically for the Yulu Burri Bar dance troupe from Sibelco Australia. The two seminars are going to be presented in partnership with the Queensland Writers’ Centre at Bracken Ridge library. The first, Introduction to Writing Memoir, will be taken by Kristina Olsson, who has published several excellent books and appeared in past years at the Brisbane Writers’ Festival. After the second seminar, Blogging and Author Platform, we will convene at the Seaview Hotel in Shorncliffe for the next part of the festival program. The Seaview has always been author-friendly. We’ve had book launches and literary luncheons there, and the Events room upstairs should be perfect for the dance performance, the Indigenous Author panels and the Read Your Own Work evening session which is open to the community as well as to local writing groups and our guests. I’ll keep you informed about our progress.